After having 'Fun Wall' as an Ala Carte option for wedding photography packages, an opportunity presented itself and we were thinking...what if guests were able to take something back with them after the wedding/ event? Yes, a photo strip would be a great memento! Use it as a bookmark, stick it on your fridge/ dresser mirror/ notice board etc.. Even in this technological era where just about everyone has a smart phone with a camera, a photo print still triumphs! Taking photos in a photo booth adds to the occasion and is heaps of fun!! We are Fiji's first established photo booth company, based out of Nadi and servicing mainland Viti Levu. Blackbox Photobooth (Fiji) provides services to weddings, corporate events, gala dinners, proms, birthdays, graduations, reunions and many more. Our booths are box - type with an open-air concept. 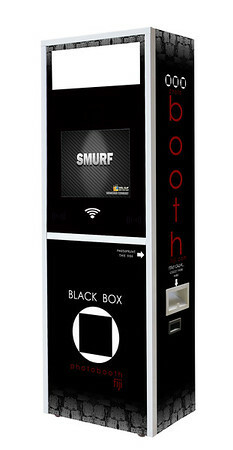 It can be set up as 'Kiosk' style (open) or 'Enclosed' (curtain) and combines old-school instant hard printing with an option for online social media sharing. With a 19" touchscreen the booths are easy to use. Just follow the onscreen prompts, wait as the timer counts down for each shot and strike a pose as the camera clicks away. Now, wait a few seconds and collect your photo strips from the side...simple!! You get 2 identical 2" x 6" photo strips for each print. You decide the number of images on each strip (2,3 or 4) by picking a template at the beginning of your session. Our printers use a 10-bit Colour Engine, creating vibrant, continuous tones for best colour output. Before your event, we will design your template(s) with your details. These template(s) will be proofed and finalized by you before your event.